Not only is Bibekta applied in a Sikh’s everyday life – for example, knowing it is wrong to cut one’s hair or that it is right to do Nitnem (daily prayers) in the morning – but it can also be applied to what one eats. Bujjar Kurehats (cardinal prohibitions) and other Rehat Maryada (Code of Conduct) rules come into play here. Keeping Bibek Rehit for eating is not a Rehit made up by individual Sikhs or a group of Sikhs. All Gursikhs keep Bibek Rehit for eating to some degree or another. Baba Jarnail Singh eating Langar prepared by Amritdharis. A ‘Bibeki’ is a person who adheres strictly to and regulates his life in accordance with the Guru’s commandments. One who truly loves Guru Ji will follow his commandments since it is dearer to Guru Ji than the Sikh itself. That Sikh has truly offered his head to Guru Ji, who only lives to please Guru Ji. However, this rehit will be of no use if one does not maintain Amritvela, perform daily Naam Abhiyaas (practice of repeating the Divine-Name), and keep humility and sincerity, otherwise keeping Bibek will just promote ego. Naam is given during initiation. So Guru Ka Langar or food that Gursikhs eat pertains to food prepared by people who have taken Amrit and received Naam. Therefore, this shows how the love of God breaks away from a being as their mind becomes clouded by filth and prevents them from performing good deeds. Note: According to Gurbani those who drink alcohol are ‘husbands of prostitutes’ (ਦੁਰਮਤਿ ਮਦੁ ਜੋ ਪੀਵਤੇ ਬਿਖਲੀ ਪਤਿ ਕਮਲੀ || Ang 399); those who don’t Jap Naam are called ‘murderers’ of the soul (ਨਾਮੁ ਨ ਜਪਹਿ ਤੇ ਆਤਮ ਘਾਤੀ ||੧|| Ang 188); those who eat meat are called ‘thieves’ (ਸਿੰਘਚ ਭੋਜਨੁ ਜੋ ਨਰੁ ਜਾਨੈ || ਐਸੇ ਹੀ ਠਗਦੇਉ ਬਖਾਨੈ ||੨|| Ang 485). Guru Nanak Dev Ji then took Bhai Lalo’s chapati and Malik Bhago’s fried sweet pancake. When he squeezed Bhai Lalo’s chapati milk dripped out from it but when he squeezed Malik Bhago’s fried pancake, blood dripped out from it. Guru then said, “Look Malik Bhago, wealth gathered by cruelty and corruption towards the poor is like sucking their blood which you have done. You had invited me to partake of blood, leaving food pure as milk. How could I accept it?” This showed that Bhai Lalo was the symbol of honesty and hard work. Therefore, the story shows how food from the faithless cynic is nothing but poison, just how Gurbani mentions that Maya is just like sugarcane which is sweet from the outside but inside Maya is just poison which only leaves pain in the end. Before Guru Amar Daas Sahib Ji became the third Nanak, he met a Saadhu (holy man) who once ate in his house. On leaving, when the Saadhu realised that Baba Amar Daas Ji was without a Guru, the Saadhu became angry and told Baba Amar Daas Ji that, by eating with him, he the Sadhu had lost all his spiritual wealth which he had earned after many years of meditation. Baba Amar Daas Ji cried the whole night. This shows that if one eats from someone who is without a Guru (has not taken amrit) and does not recite the Gurmantar, one looses their profit of Naam. So how can they ever cross over? By eating by someone who is unrighteous, they too become unrighteous. When we eat from a faithless cynic, this affects our Naam. It influences the five vices and thinking. Just as when people say, “you are what you eat” due to physical health, this also includes for our spirituality. Sai Mia Mir was very close to Guru Arjan Dev Ji. However, Guru Sahib didn’t even consume food from Sai Mian Mir even though they were very close since Sai Mian Mir was a Muslim (non-Sikh). Sai Mian Mir prepared different utensils to be used for Guru Arjan Dev Sahib Ji for cooking and eating food from. Whenever Guru Sahib and his Sikhs stayed over with Sai Mian Mir ji, these utensils were used to cook and eat langar from. Also, even different utensils were used to cook food for Guru Arjan Dev ji and Guru Sahib’s sewadars. This proves that Sikhs and Guru Sahib himself did not take food cooked from those who were not Sikhs. One day Guru Gobind Singh Ji went to Bhai Dayaal Daas’ ( descendant of Baba Aadam Ji) village and told Bhai Sahib to take Amrit. Bhai Sahib did not take Gurus Hukum seriously and ignored the request. 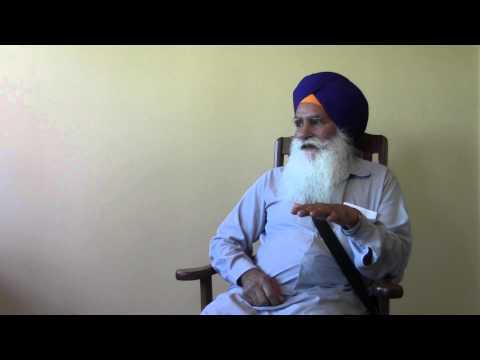 Some time went by and Bhai Sahib had a strong desire to meet Guru Sahib at Sri Damdama Sahib. When approaching Guru Sahib he greeted Guru Sahib but Guru Ji ignored him. Bhai Raam Singh a devoted servant of Guru Sahib asked Guru Sahib why he had ignored Bhai Dayaal Daas knowing that he was descedenent of a Gurmukh (Baba Aadam Ji ) who served the fourth Guru. Guru Sahib responded “He is without a Guru, he has not taken Amrit”. Dayaal Daas responded “I am a Sikh. Sikhi has been in my family since the fourth Guru. I don’t smoke, drink or eat meat. I dont cut my hair”. Still Guru Sahib did not embrace him. Bhai Ram Singh Ji told Dayal Das “We will be apporaching your village in some time prepare langar for the Guru.” When Guru Ji approached the village ( Bhuchey) Guru Sahib’s horse was thirsty. There was a nearby pond in the village; however, Guru Sahib’s horse did not drink from the pond. When the Sangat asked Guru Ji as to why the horse refused the water from the pond. Guru Sahib said that in this village there is a ‘nigura’ . Meaning their greeting is insincere. During the Dharam Yudh Morcha Baba Ji visited the city of Phagwara for an event. Baba Ji had been in Phagwara since the morning, the Sangat requested Baba Ji to eat Langar however he declined. Later on in the day, the Sangat pleaded again that Baba Ji eat Langar as he had not eaten anything since the start of the morcha (protest). Baba Ji replied, “Is this ‘Guru-Ka-Langar’ or ‘Mil-Goba Langar’?” ‘Milgoba’ means mixed, confused or doubtful. Baba Ji went on to say, “If it is Guru-Ka-Langar I will eat it.” The Sangat realised what Baba Ji meant and returned back without having served food to Baba Ji. In Amrit Sanchaars (initiation ceremonies) the Panj Piaare give the clear directive: “ਖਾਲਸਾ ਦੇ ਰੋਟੀ ਬੇਟੀ ਸਾਂਝ ਖਾਲਸੇ ਨਾਲ ਹੈ |” (“The Khalsa keeps the relation of dining and marriage within the Khalsa”) which has been passed down in oral Rehat since 1699. It is noteworthy that although an Amritdhari Gursikh does not eat cooked or prepared foods from a non-Gursikh, this does not apply to raw ingredients. From the above, it is clear that a Sikh eats from fellow Sikhs. As a Sikh cannot eat from tobacco users or those who cut their hair it follows that a Sikh cannot eat from restaurants or places where non-Sikhs or at least people with cut hair or who smoke prepare the food. Those Sikhs who eat only from Amritdharis avoid any situation of violating the Rehit (code of conduct) as per the Akal Takht’s Rehit Maryada. By even accepting water from a smoker is similar to drinking alcohol! What a bold statement Kavi Santokh Singh has made here. If just accepting water from a smoker is similar to drinking alcohol, then one could only imagine how much one would suffer for letting such a person make their food. Now people may use the argument that if the person is not a smoker it is okay, but this is also not true. Guru Sahib has listed four Bujjar Kurehat’s, no one Bujjar Kurehat is worse than the other. Thus, eating from a smoker is the same as eating from a meat eater, someone who cuts their hair, or an adulterer. Whatever level of practice an individual interprets is right for them, a Gursikh should at least observe the minimum. The reason Gursikhs increase the level of observing Rehat is only to strengthen their mind, to avoid it wandering whilst in connection with the Divine and to improve concentration. If these Rehits (or any other) are kept for any other reason (for show etc) they become a hindrance to us and slow down progression, which in return becomes hypocrisy (pakhand) and ego. This is the reason why a lot of Gursikhs keep their personal Rehit discreet, to avoid collision with ego. « What do the different spellings of Naam mean in Gurbani? The quote about meat and fish is from a historical Hukamnama (edict) issued by Guru Hargobind Sahib Ji, the sixth Guru. This Hukamnama and other historical documents written by the Sikh Gurus has been published in a book by SGPC historian, Professor Ganda Singh. The book name is “Hukamnamey”. ..secondly Langar da Bhogg vi lagda hai…if guruji can eat then why can’t we? I am not contradicting eat bibek…it is really good…and me too preparing My mind for it…but I have this confusion??? If Langar is prepared and served in accordance to Maryada, then one should eat it. If it is not, then there should be no guilty feeling for not eating it. Gurur Ji only accepts and eats what is made in accordance to Maryada.